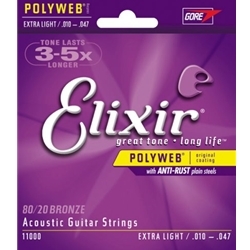 Elixir 11000 Polyweb Extra Light Strings make any guitar sound great and playing longer.. Enjoy the playing ease of an electric guitar with great note-bending ability. Elixir Acoustic Guitar Strings are the first major innovation in strings in over forty years. And they deliver what they promise: great tone and long life no matter what guitar you put them on or how often you play. Elixir Strings are covered with an ultrathin, space-age polymer tube that contacts the string on the tops of the windings only. This leaves the all-important winding-to-winding-to-core space free from the fear of the enemies of tone!